It is with great excitement that we announce the arrival of a new, highly demanded feature here on PeoplePerHour – Contests! 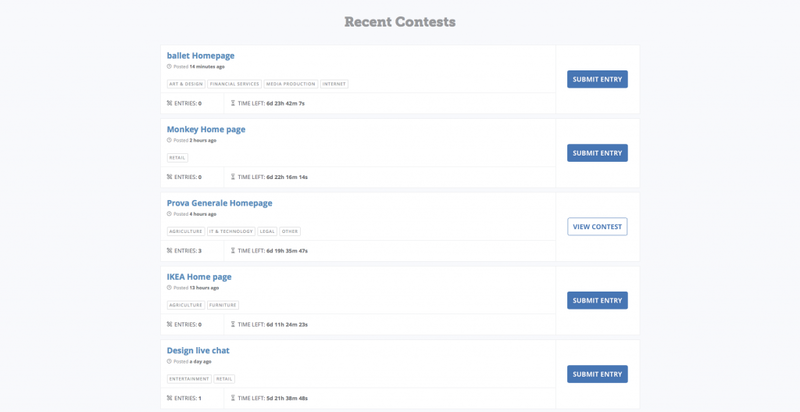 What are Contests and how do they work? Usually our Buyers post a Job in order to find a Seller who can design their website. With Contests, we offer simple and transparent pricing and our Buyers are now able to see exactly what they’re getting before purchasing. Let our designer’s work do the talking, not their words. Sellers, in turn, have the ability to participate in numerous Contests thus, increasing their chances to earn fast and easy money as well as to boost their CERT score! Who doesn’t want to boost their CERT score?! How does it work for our Buyers? Buyers, upon arriving on the landing page, can post a website design Contest in order to crowdsource ideas. All they need to do is complete the Contest post form and pay the Contest fee in advance. How does it work for our Sellers? Contests will be listed in the Contest listings page of PPH and Sellers will be able to participate by submitting unlimited entries anonymously. The entry will be for 1 page of the Buyer’s website. What do our Sellers win? In each Contest, the best submission will be awarded with a Contest Prize of £300/$370/€335. Once a winner is selected (according to the Buyers preferences), they may continue to work with that winner on the entire website. Whatsmore, the Sellers of the top 5 most rated entries will be rewarded by receiving a boost in their CERT score! The ability to see what you’re getting before purchasing – let our designers’ work do the talking, not their words. Let your work speak for itself. Compete with others based on the quality of your work rather than words in a proposal. Show the buyer just how fantastic your work is! Know exactly how much you will be paid if you win. No need to propose a cost and worry if you had been “out-bid”. This feature has been implemented after receiving a number of requests from our community to create a Contests feature! So what are you waiting for? 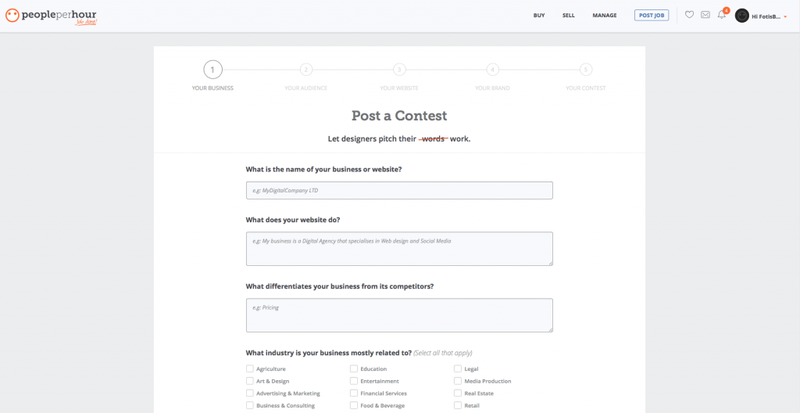 Check out our brand new Contest feature and let us know what you think! I think this is great but I think the ratings system is unfair. If you are participating and have submitted an entry, you should not be allowed to vote. Users are blatantly using this system to knock down their competitors which is bad game. Not impressed. I thought this was People Per Hour with a focus on individuality? 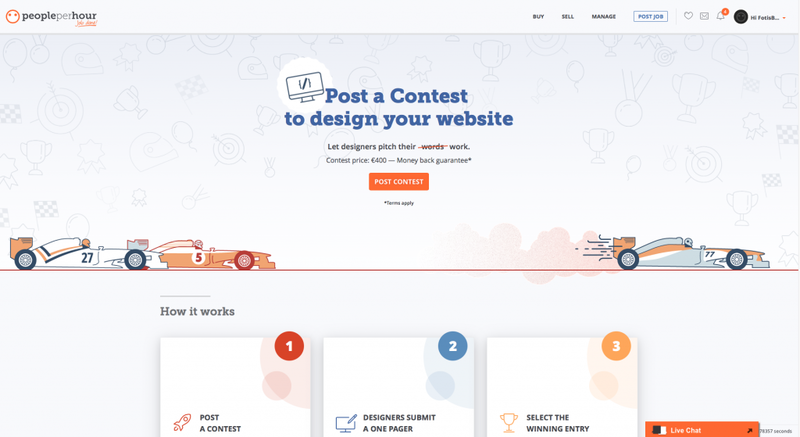 Why are contests for web design only? What about other areas of design? Hopefully this will extend to all the areas of design. I think it will drive up standards as designers will put forward only truly good efforts and those who use generic logo packs etc (gives hard stare) will be weeded out. Those of us who are confident in our services and skills will enjoy this. I think this is great, but still the fact that the rating system is controlled and can be controlled by the contestants, which is not that great at all. I believe that should be improved. I think I don’t understand how can a website be valued at a fixed price of 300 pounds. A website might have 2 pages or 50 pages, static or dynamic, back end powered and what not. When you later start working on it after you have won the contest and the buyer wants to add features to it but will not agree on your pricing of the same, what happens then? As I understand, CERT scores are competitive across all freelancers in all areas. Will boosts in the CERT scores of design contest winners mean that writers such as myself – who don’t have the opportunity for anything similar – fall lower down the list & can’t do anything about it? Sorry if I’ve misunderstood. Its all most very important site. If you are participating and have submitted an entry, you should not be allowed to vote. Users are blatantly using this system to knock down their competitors which is bad game. What if the project requires more than £300’s worth of work? Some websites require more time and energy than others. Doesn’t seem like a professional way to work. Unless I’ve missed something? I’m slightly confused on the pricing. The way everything reads sounds like you will be designing a full website for someone for a £300 contest prize. I know initially you’re designing a one pager but there doesn’t seem to be a suggestion of what happens after you win when it comes to payment …and i have read and re-read this to try and find something that suggests that’s not what this means. Hmm. Do the buyers then HAVE to pick a winner, or can they just let the contest go stale and take someone’s idea without paying them? This seems to go directly against the “no asking for free samples” rule on PPH, too, which is reassuring because of the aforementioned risk. Hi i romen. I wish there would be a good freelancer. I am working hard to keep my wish. Hopefully one day we will get good results. lancer.I am best with my work it’s my hobby, habit, passion& a dream to be a best freelancer always willing to work with the client until client’s need .. I agree with Chris’s comment. As a cartoon artist and graphic designer, I’d like to see some contests for other areas of design. It is very limited as of now with just web design as it’s sole content. Well, guys, they have always been favoring designers if you observed carefully. The homepage itself glorifies web designing as if there is no other service is offered on pph or as if other sellers are of no value!! However, EVERYONE have to pay the big fat fee of 20%. I don’t agree with contests in general. A big waste of time. This will become another 99designs or designcrowd platform. Happy to not having contests at all… if still you guys wanna do it, go ahead. You don’t have my support as it goes in the cloent favor totally with nothing in ours. unfair people will steal freelancers time and ideas. What a brilliant, original idea. You know, I remember the time when graphic design was taken seriously. So PPH is moving towards a visual/design bias in terms of only visual based service providers can have an opportunity to boost their cert scores through contests? Where does that leave the rest of us whose work is not visually based? It’s not a level playing field on the scoring system. Is People Per Hour shifting towards the ‘spec work’ business model? Or am I missing something? I feel slightly disappointed by this! I think submitting design samples with only the promise of being paid might be good for junior designers/ freelancers who want to get a bit of experience but otherwise the whole thing is just contributing to an existing problem. How is design/ or any other profession going to be truly valued if we are willing to work for free? Again…I might be missing something so feel free to contradict me. This appears to be a bunch of people doing the work upfront and then a seller choosing one “winner” – leaving most people unpaid for the work they did. It would be great if you include contests for other type of jobs: like naming or taglines. Not only designs. Isn’t there a website doin99 this already? Hope there are contest for other categories too, like game development. VERT IMPORTANT – How do you stop a design being stolen from us? How do YOU protect your freelancers? So it is work for free with no guarantee, maybe you should not have linked to the page. Just joining the chorus: this is a terrible idea, for all the reasons mentioned above. Take this contest idea away. It is totally against PPH and the way people should do business. PPH states in it’s T&C’s not to undertake free/sample work which this contest idea totally promotes. Let your portfolio and client reviews provide assurance to buyers. Freelancers do not have the time to provide high quality free work for contests and they should not be asked to. Take this contest idea away! This is the approach of 99designs – really not a good idea. Work for free, no guaranteed feedback or money. Why? Unpaid pitching is very damaging to the creative industries, it undermines the value professionals provide whilst simultaneously overwhelming the client. I suspect no self-respecting, seasoned professional will get involved in these competitions, which will restrict the talent available to the client. The inevitable outcome being a pool of uncommercial clients lead by rank amateur creatives. Such a destructive decision. Free pitching is a bad idea which the creative sector has been trying to stamp out for years. Joseph S. wrote his sentiments so well. EXACTLY how I feel on the subject. Thank you. I have to agree with the others that this is a bad idea, cheapens the web design skill and the voting system will 100% be abused. PPH, we all suggest a rethink. Please listen to us. What I experienced from this site…….. That is ridiculous……. After that… I Hurriely rushed to google and search….. I joined this site as simple as any one can join facebook….. They said… My profile is ready to sell things….. But then I go for job…. Again they want every process again…. And at last no job for you…….. This website is a fake website…..
For Jst kidding with people’s feelings…..
Don’t you think a lot of the buyers on PPH already treat us freelancers as 2p per hour mugs without inviting slavery too?! I am no website designer, and I hope this does not get applied to what I do! From a designer’s perspective, I do see quite a few weak points in this. Most important one is (as few of us remarked earlier) it is like giving ‘free ideas’!!! Guys, ‘ideas’ is one very important thing! It is the seed from where all starts up. We cannot, better should not, share that for free. Voting system- Yes, it can very well be played with. PPH is already making, have already made few, not that good decisions. As a seller I don’t like this idea. It’s exploits freelancers into working for free. It’ll be popular with buyers because they get lots of ideas for free and can compare lots of bespoke work tailored to their brief. Only one can win, or perhaps none. Buyers may pay the initial fee for lots of ideas and then take them to their own developer outside of PPH. 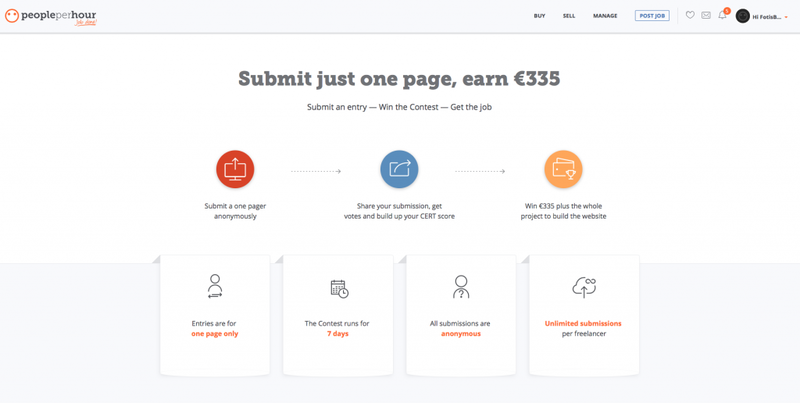 Other websites offer the same contest format and it may be good in some circumstances. But introducing it to, what I thought, was a respectable and professional freelancer community isn’t a good idea. This is real ‘race to the bottom’ stuff. Constantly devaluing the hard work of people. I hope this nonsense doesn’t ever appear for copywriters. Sounds all too much like the ridiculous contests and crud going on at the other freelance site I’m sure we all know about that has the little origami bird as their icon- their contests are utter crud and these are too. it is no way ANY freelance seller should work- EVER! I find this to be just disgusting. Not just will we be incapable of truly creating something good. This will be manipulated heavily and for some poor sod’s will result in days of unpaid work. This is truly disgusting. Why should we work for free? It’s a dumbass idea, no self-respecting freelancer will work for free to “win” a BS competition for internet points and maybe some chump change. Rating system is very unfair. you need to disable rating option for entries. also need to disable viewing others design. This is a nice IDA. I am really happy to seen this . Thanks Admin. They have clearly mentioned that buyer will only 1 of website. So, spec work, then. Nice. Glad I saw this before signing up as a freelancer. I’m sure it was “highly demanded” – scammers are always demanding new suckers, so accommodating of you to provide them. Even if copywriting isn’t affected (yet), I don’t want to do business with any company sponsoring this. This idea is a dumpster fire. I will be telling my colleagues to take their business elsewhere. Terrible idea for all the reasons mentioned above. I feel sorry for PPH to make such a move. Stop milking the designers. Start respecting creativity. We don’t have unlimited time and a if we had a trust fund we wouldn’t be here. Its good but in PPH it’s really hard to get the first job. I think who would take a contest, he should get a positive feedback from buyer. and PPH team should give him a badge in his profile. Looking at the passionate responses here I think PPH needs to revise this feature. I am a writer, in the main, and there’s no way I’d be pitching and wasting time writing something that buyers could then use for nothing. I think this is a retrograde step and I’m totally unimpressed. Once again buyers are prioritised over sellers. Not ideal. It’s a good idea from PPH.Thanks a lot, PPH team. Great! Worst feature ever. I like PPH for the fact we get work on our proposals, portfolio and ratings. Now this is going to be a case of doing work for free and hoping the buyer picks us. Cheers PPH for coping all the other sites. So PPH wants designer to spend hours and get nothing if they fail the contest. No thank you PPH. This clearly reflects PPH value less to designers/ developer. Happy To Join People Per Hour! Your Belief and my sincerity will make our business relationship greater. Eagerly waiting to start work on People per Hour! I’m new but I’ve adequate experience in Graphics Design and Web Design. Happy Day! The usual PPH rubbish I see. Huge demand but never a mention of it before and absolutly no forum in which anyone could have demanded it. Rules say buyers can’t ask for free sample, then PPH offer an award for everyone producing free samples. Come on PPH, you are either a serious work platform or a game show..which is it? Please state clearly on the page that contest are NOT GUARANTEED! I’d never take part in one if I knew. In fact even thinking it was guaranteed I wasn’t sure if it’s worth it. Contest is a good option for designer , it should be for log and other design option as well. Regarding rating system rating only allow by the buyer so it will be fair. I want send proposal but couldn’t it. please help me and solved the problem. Many thanks for your message. Have you tried contacting our customer support? Please try emailing us at support@peopleperhour.com. Thanks so much! Bad Idea. Let’s say you value website design at $300 you get 100 designers spending their valuable time trying to win the business. Ultimately you have managed to generate $30,000’s worth of designers time and effort so that ONE designer can earn $300? I’ve always hated pitch work where the client asks as many designers as they like to submit ideas. The client should do some homework long before this stage and choose maybe 3 designers that he feels could produce the sort of work he’d like. How can the seller know the budget that the buyer wants to pay for the entire site?